Log in to your Twitch account, and open your dashboard. Click on the "Stream Key" option in the navigation menu. Click "Show Key" to reveal your unique "Stream Key". Copy the value to your clipboard being careful not to include extra spaces at the end. Log in to your Switcher Studio dashboard, and create a new channel using the "Channel Settings" menu. In the "Server URL" field, enter the following URL: rtmp://live.twitch.tv/app/. If you have trouble with that Server URL, try using rtmp://live-ord.twitch.tv/app instead. 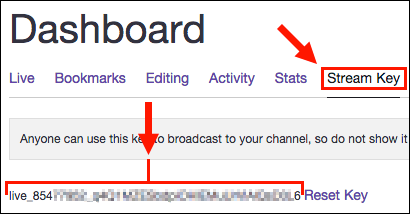 In the "Stream Key/ID" field, paste the Stream Key from your Twitch Account. To optimize your output settings based on your Internet speed, select a preset (Low-Med-High-HD) or create a custom configuration. 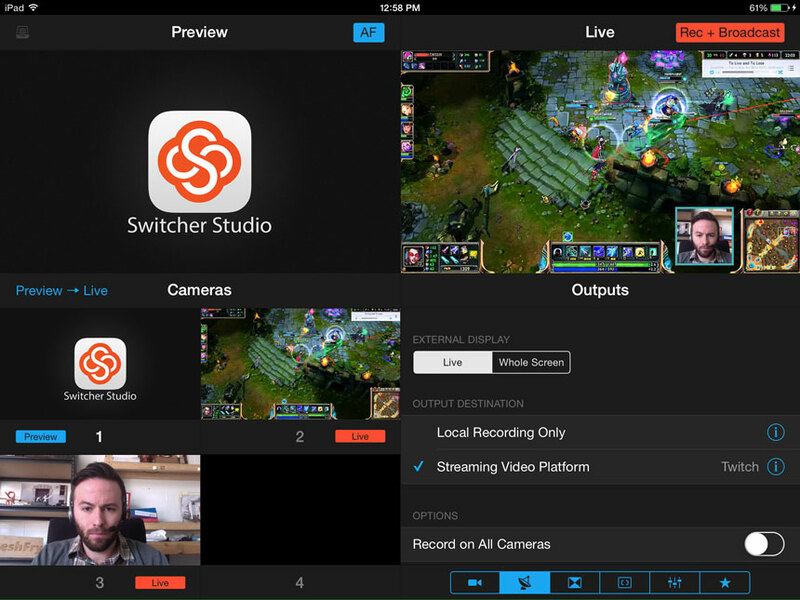 Switcher is a multi-camera video production and broadcast tool that allows you to connect multiple iOS cameras and share your computer's desktop. While using Twitch, a user may want to show a computer's screen while also displaying another perspective of the player's face. One may also want to insert full screen graphics or PNG overlays from sponsors. This is easily accomplished using the Picture in Picture setting from the"Multi-view" feature as well as the "Graphic Elements" menu.